"I usually find something interesting in there. Just not what I was looking for." 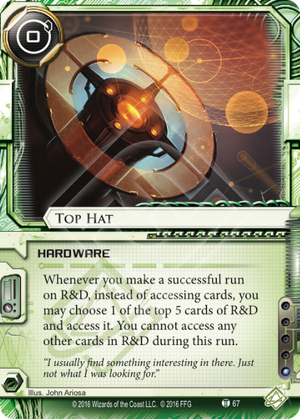 Does Top Hat allow the Runner to see the top cards of R&D before choosing which to access? "you may choose 1 of the top 5 cards of R&D and access it." Can you guess what is missing from this card? Two words are conspicuously absent, what are they? Give up? The answer is "look at". (I also would have accepted "reveal", although that's not how the templating normally goes) That's right, folks, without looking at the cards, you get to decide which of the top 5 cards you'd like to look at. "I'll look at.... number 4"
Is this good? Maybe, but not without some support. Accessing the top card of R&D is not much different from accessing a random card from R&D, if anything it's slightly worse, as the top card goes into the corp's hand, so that's extra info. So, when is this ability good? If you have some info about the top few cards of R&D, accessing a particular one may be beneficial. Perhaps a digital friend or your bioroid programming have already told you that the top card isn't anything you want. Maybe you've already got R&D locked down, and your R&D Interface can only dig you so far. Looking one card further may help you grab that pesky final agenda. Evoking imagery of conjuring something unseen from a digital hat, this magical card links thematically with Ele "Smoke" Scovak: Cynosure of the Net. It also has some interesting thematic and mechanical interactions with several other cards. Of course, this card pairs nicely with anything that gives you information about the cards in R&D. See the top card using Woman in the Red Dress, Spy Camera, or Globalsec Security Clearance then bypass it if you want to keep digging. Do this as many times as you can run R&D in a turn for an additional unique access each time (barring additional shenanigans). As the number of successful R&D runs increases, there are other interesting interactions. With Equivocation the interaction is relevant on your first successful run on R&D. If you don't want to access the card revealed by Equivocation (it's not an agenda or must trash asset for example) you have options. One is to put that card in the corps hand, allowing you to access the second card directly. Another is to not put that in the corps hand, and use Top Hat to access the second card. Or third or fourth or fifth but without additional information these are functionally equivalent. Why choose one over the other? Well obviously on the one hand you are denying the corp a free draw by using Top Hat, usually to be preferred although mill type decks or certain combos may choose to offer the card anyway. As has been noted, in using Top Hat you forgo accessing any cards in the root, allowing you to dodge cards like Prisec, Cyberdex Virus Suite, Mumbad Virtual Tour, Disposable HQ, or Product Placement. That can be good. At the same time, you may want to access and trash any number of upgrades (Caprice Nisei or that Crisium Grid that's blocking your Indexing play, the list goes on) and therefore you may choose not to activate Top Hat. Now, on the second run things get more interesting. Obviously, your second run can dig past uninteresting reveals from a Find the Truth run elsewhere. Or, you can run R&D with Find the Truth on your first run, either accessing the reveled card or bypassing it as with Equivocation above. Indexing presents perhaps the most interesting multi-run interactions. Find but can't access 2 agendas? Bury 1 deep and potentially grab it next turn. Or, continue to get unique accesses on subsequent turns while you maintain R&D lock for up to 5 turns. Obviously, Top Hat will pair will with cards that reward multiple runs. Temüjin Contract, Net Mercur, The Turning Wheel (to gain tokens - you can't combine them), Datasucker. Consoles like Doppelgänger or Mirror. Events like Dirty Laundry or Möbius. Dodge the operation that Seidr Laboratories: Destiny Defined pulls from Archives when you their ICE. Bottom line - is this a tier one tournament card? Not as of this writing and maybe never (Station One). Is it interesting and playable? Yes. So as according to @andrewboydston, Top Hat is good when you are accessing cards with the knowledge that YOU KNOW what you are accessing, otherwise it's just another random access. With Insight, runners are now able to SNIPE that agenda without double running R&D which is kind of suicidal against the new hot Corps of lobstermodernism Argus and the sneaky Mti who can install ICE on the fly despite being once per turn. Also, multi runs in the recent meta is very punishing for the fact that you need to respect the new Econ Warfare > HHN > HPT combo turn and also spending a huge amount of boon you looted just to score that one agenda. Despite giving the Corp a chance to re-arrange what they can draw for the next 4 cards, Insight also allows you to LOOK AT the top 4 cards that the Corp just arranged. So if there's no agenda, treat it as a blank Indexing you just made and chill out to make the sniping run for agenda without breaking a sweat on R&D. Oh, and what if the Corp ICE up R&D when they see this coming? Great! Now you have slightly vulnerable HQ or scoring remote to break in then. Did I mention Top Hat is only 1 influence? So for each Insight and Top Hat pair, that's the same influence you spend on Indexing! Top Hat is also a hardware, so perhaps you might only need to land 1 on the board and only 1 or 2 copies will go into your deck. Although theoretically you are spending a slot of two for this pair, but it really doesn't matter as long as it wins you the game. A calculated risk and sure-fire agenda scoring is better than suicidal multi runs which would lose you the game.